The Santiago Satellite Station has three TT&C antennas, operating in S-Band up and downlink. All of these antennas interface with the operations building, where the receiving, processing, recording and monitoring systems are located. Operations are remotely controlled from the Network Management Center in Kiruna, Sweden, on a 24/7 basis. The station hosts antennas and baseband equipment from foreign organizations that operate on S-band, C-band, and Ka-band. It has plenty of room for additional similar systems. 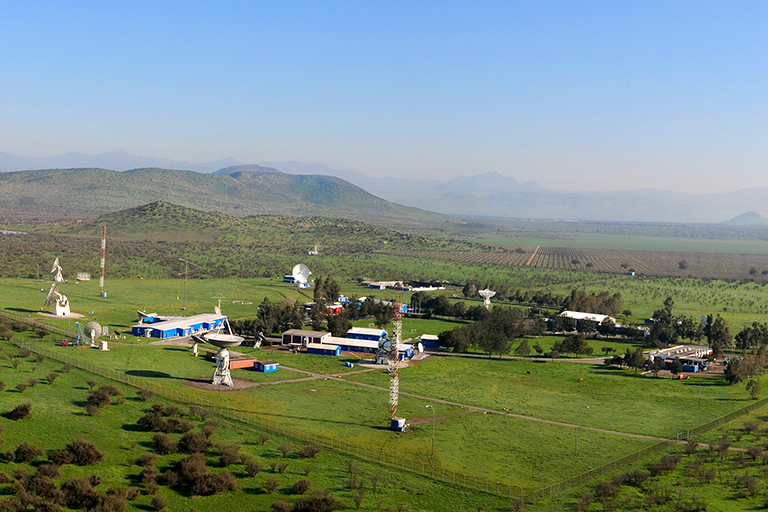 The Santiago Satellite Station is located north of Santiago in the Metropolitan Region of Chile, at 33º 08" South latitude, 70º 40" West longitude. The altitude of the site is 723.4 meters above sea level. The facility occupies an area of 100 hectares surrounded by the foothills of the Andes that provide natural protection against man-made electromagnetic interference.